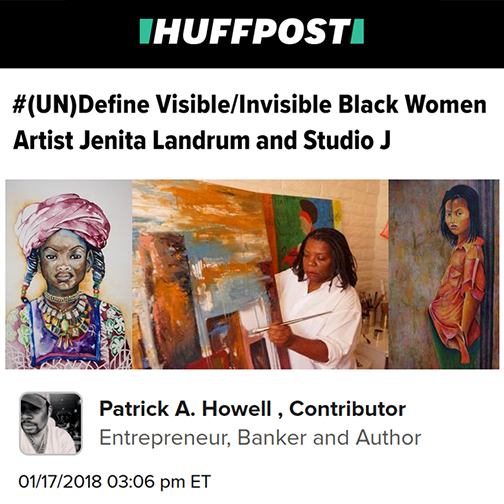 Check out this HuffPost feature by contributing writer Patrick A. Howell about Rio Salado PLUS Facilitator and Phoenix College art history adjunct faculty instructor Jenita Landrum, which provides some insights into her work as an artist and curator of Studio J in Phoenix. "Art means to me living a true creative life that is never knowing, but it is also searching for what feels right in my creation, and to define what is beautiful to look at," said Landrum. Landrum, who has been a professional artist for 38 years, has focused much of her work on themes of “invisibleness,” and celebrating the essence of being a black woman. #(UN) Define Visible/Invisible Black Women in Columbus, Ohio at Shot Tower Gallery. "As a Black Women that entered college in 1980’s, doing research it was hard to find positive images that looked like me and didn’t objectify our bodies, they were somewhat invisible or not easy accessible," said Landrum. "Part of my drive is to leave a body of work that celebrates and focus on what makes black women resilient, powerful and to lift black artist to a higher prominence."